Great for smaller bathrooms the new Pier WC has the shortest projection in the Bauhaus range with a total projection of 430mm. Soft close seat and cover included. Small bathrooms no longer have to compromise when it comes to great design and first-class function. 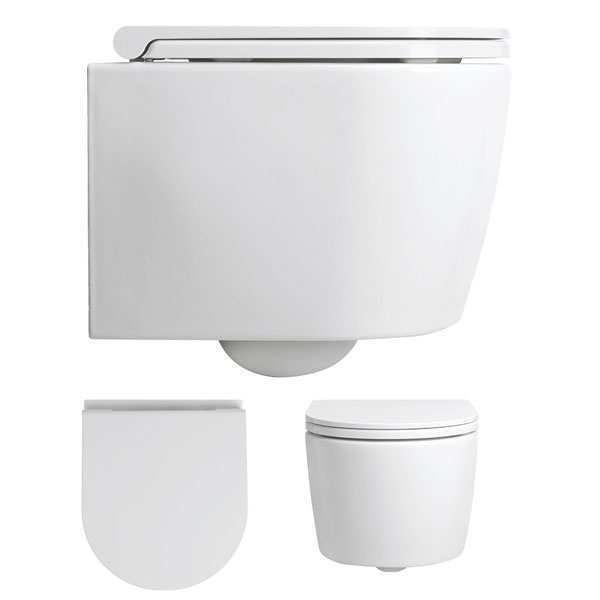 The Pier WC, a contemporary yet very simple toilet, has the shortest projection on the market at a minimal 43cm. Not only compact, the seat is still extremely comfortable and fits perfectly in limited spaces, whilst the high-function flush performance is as good as it gets.Introducing an innovation in ceramic glaze technology, Pier is expertly crafted from CERASLIDE®; a forward-thinking firing process that ensures the perfect surface consistency to resist stains, limescale, daily wear-and-tear and assist with flush performance. Teamed with the BATAFORM® anti-bacterial treatment, the combination ensures an impeccable level of hygiene alongside a luxurious gloss finish, ensuring all round wellbeing in the bathroom.